Abraham Doras Shadd, the first Afro-Canadian to hold public office, was born in Wilmington, Delaware on March 2, 1801. He was the grandson of a white German soldier from Hesse Kassel, Germany and a free black woman. Shadd was free born and earned a respectable living as a shoemaker, supporting his wife and thirteen children. His passion, however, was obtaining civil rights for African Americans and later Afro-Canadians and he devoted his life to the abolitionist movement which sought the immediate end of slavery. Although he favored abolition, Shadd opposed the African Colonization Society because it proposed to send African Americans to Liberia. He believed instead that the future for blacks was in North America and argued that education, thrift, and hard work would enable African Americans to achieve equality. By the late 1820s Shadd was a "conductor" on the Underground Railroad from his homes in Wilmington, Delaware and later West Chester, Pennsylvania. From those homes fugitive slaves would travel the "railroad" to freedom in Canada. Shadd hid escaping slaves and provided them with food, clothing, and guidance as they made their way north. He also continued his public activities on behalf of abolition. He was a member of the American Anti-Slavery Society headquartered in Philadelphia and in 1833 he was elected President of the National Convention for the Improvement of Free People of Colour. In the early 1850s Shadd moved his family to southern Ontario’s North Buxton area where they joined many of the families he had helped guide to freedom. In 1859, at the age of 58, he became the first black man to serve in Canadian public office when he was elected Counselor of Raleigh, Ontario. Four of Shadd’s children became prominent in their own right. Mary Ann Shadd (1823-1893), an educator, journalist, and lawyer, was the first black woman in North America to publish a newspaper. I.D. Shadd, after the Civil War, returned to the United States and served as a member of the Mississippi Legislature between 1871 and 1874; Abraham W. Shadd, a graduate of Harvard Law School, became a prominent attorney in North Buxton and Emaline Shadd was one of the first women appointed to the faculty of Howard University in Washington, D.C. In 1994, the road that traverses the heart of North Buxton was renamed A.D. Shadd Road in his honour. 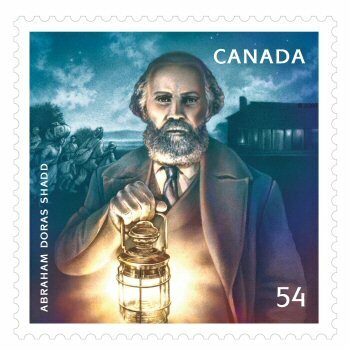 In February 2009, Canada Post honoured Abraham Doras Shadd with a commemorative stamp. Colin A. Thompson, Blacks in Deep Snow (Don Mills, Ontario: J.M. Dent & Sons, 1979); Joseph Mensah, Black Canadians (Halifax: Fernwood Publishing, 2002); http://www.buxtonmuseum.com/history/hist-shadd-abraham.html.